Dr. Micheal Fisher has been co-medical director of acute dialysis at Santa Barbara Cottage Hospital since 1984. 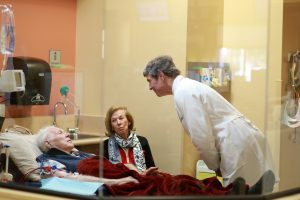 The co-founder of Santa Barbara Artificial Kidney Center—a dialysis center—until his diagnosis with lung cancer five years ago, he was also an associate professor at the USC Keck School of Medicine. Although now semi-retired from his medical practice, he has not stopped working. 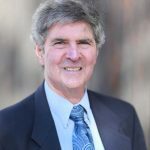 A longtime Montecito resident, he recently wrote a book, Surviving Kidney Disease: True Stories of Love, Courage, Hope, and Heroism…and a Roadmap for Prevention, intended as a way to honor the courage of his patients and to raise the alarm about a looming epidemic. Chronic Kidney Disease (CKD) already affects some 35 million Americans—many of them unaware that they have it—and will kill more of them annually than either breast or prostate cancer. Moreover, the incidence rate is skyrocketing, tracking the rise of obesity, diabetes, and hypertension, which are the three leading causes of CKD. Goodman: What should people know about kidney disease? Fisher: That it has become the 12th-leading cause of death worldwide and that 35 million Americans have the disease right now, although many of them don’t yet know it. CKD is called “a silent killer” because our kidneys can function with as little as 30% of their capacity. By the time people find out their kidneys are failing, they may already have lost 70% of kidney function and they suddenly become deathly ill. According to the 2015 Global Burden of Disease Study, mortality from chronic kidney disease has increased 32% in the last 10 years. That is consistent with my own medical practice. Obesity, diabetes, and hypertension are the three leading causes of CKD—and stress is implicated in all of them. Stress increases production of the hormone cortisol, which increases blood pressure (hypertension), elevates blood sugar, and creates an insulin-resistance environment, which lays the groundwork for diabetes. Moreover, many people eat or drink as a way of reducing anxiety. We eat too many processed foods, which are loaded with sugar, salt, and excess calories. As a result, up to 40% of Americans are now obese, including up to 19 percent of children. We’re even seeing Type 2 diabetes, so-called “adult onset diabetes,” in children. This portends a future of even more Chronic Kidney Disease—which can only be treated with dialysis or a donated kidney—which is by far the preferable alternative. Goodman: What is the biggest health consequence of kidney failure? Fisher: Unless promptly treated, kidney failure results in death. The kidneys are responsible for many essential metabolic tasks. Most people know that they filter toxins from the blood. Lose kidney function and toxins build up in the body, where they have the potential to damage other organs, including the brain. If your kidneys fail, your other organs will fail. The kidneys also maintain fluid balance in the body—how much water you retain. The retention of water by failing kidneys raises blood pressure. High blood pressure further damages the kidneys’ filtration system, further increasing blood pressure. Kidneys also maintain the body’s acid-base balance so that our cells maintain optimum pH. The kidneys perform other essential functions, too, such as producing a hormone called erythropoietin, which prevents anemia. They’re also responsible for converting vitamin D into the active form our bodies need for strong bones. As our kidneys fail, we don’t have enough vitamin D and we start getting bone disease, or we become anemic. Goodman: But most people are born with two kidneys, right? Can’t they lose one and continue functioning? Fisher: Unfortunately, most kidney disease affects both kidneys simultaneously. Which is why it’s so important for healthy individuals to consider kidney donation. It’s one of the main reasons I wrote my book. Yes, dialysis can keep people alive, but with a healthy kidney transplant, they can feel good again—as good as they felt before their diagnosis! Organ donation technology has vastly improved in the last 20 years. In most cases, transplants are now done laparoscopically, with minimal downtime. The tissue-matching technology is better, as are the anti-rejection medications. I know many patients who have received not just one, but as many as four kidneys over time, and are still thriving today. Donors, too, get a boost, knowing that they’ve saved someone’s life. It’s almost as if we were given two kidneys by design—so that we could donate one. Goodman: Why did you choose to go into medicine? Fisher: When I was 12 years old, I was inspired by the classic book, The Citadel, which is about an English physician who leaves his practice among the London elite to return to treating the poor residents of coal country. Although briefly seduced by the allure of wealth and society, he ultimately chooses to live his values by helping those who need him most. Then, in high school, I was inspired again by the S.S. HOPE, which traveled the world providing free, life-saving surgeries for people without other access to medical care. That became my yearbook aspiration. Goodman: And what prompted you to specialize in nephrology? Fisher: I was drawn to internal medicine because of the diagnostic challenges—how to correctly interpret symptoms for the right diagnosis. I was fortunate to have a professor at State Medical University of New York in Syracuse who had some of the first electron microscopy images of the glomeruli—the kidneys’ filter system. Those images fascinated me, so I started reading more about kidney function. Then, I interned with a nephrologist who could diagnose a lot of disease just by looking at his patients’ urine, which he used to call “a poor man’s biopsy.” He, too, reinforced my interest in nephrology. After graduating from medical school, I joined the Peace Corps—an experience that remains one of the most significant of my life. It was such an affirmation of our common humanity, no matter our ethnicity, language, or cultural differences. I was assigned to La Paz, Bolivia. One day, a father from the Altiplano brought his young son to us for treatment. The boy had nephritis—an inflammation of the filtration system of the kidneys that is fairly common in childhood—and was swollen from his neck to his feet. We were able to treat the infection with antibiotics, and the boy readily recovered. A few months later, on New Year’s Eve, I was awakened in the middle of the night by a knock on the door. There stood the father, with a chicken in one hand and confetti in the other. He threw the confetti in the air, wished me happy New Year, and presented me with the chicken and some eggs as a thank-you gift for saving his son’s life. That was just one of the wonderful experiences I had in the Peace Corps, which taught me that these experiences can be commonplace—if you’re willing to risk getting out of your comfort zone. Goodman: How do you get out of your comfort zone these days? Fisher: By writing and promoting my book and speaking as often as I can about the threat of kidney disease and the steps we can all take to prevent it. Fisher: Diet, exercise, and perhaps most important, managing stress. Human beings didn’t evolve to live under constant stress. Stress was intended to get us through short-term emergencies, such as fleeing a predator or fighting a foe. Under stress, our normal maintenance and repair functions shut down, so that all systems are available to fight or flee. If stress is constant, those maintenance and repair functions are deferred indefinitely, which takes a terrible toll. There are other negative effects, too, as I’ve previously mentioned. Current research shows that stress can flip the epigenetic switches for diseases like cancer, Alzheimer’s, and autoimmune conditions. Moreover, the effects of severe stress can be intergenerational, triggering disease in the children of mothers who were traumatized while pregnant. I believe it was even a factor in my own lung cancer. Goodman: How do you manage your stress now? Fisher: Some of the techniques I’ve learned are as simple as taking long, slow, deep breaths through the nose. Nasal breathing activates the parasympathetic nervous system, which is responsible for bodily repair and restoration functions. I also enjoy yoga, taking walks in nature, and spending time with my family. The key is to find and make time for what is peaceful and restorative for you. In fact, it’s a matter of life and death. 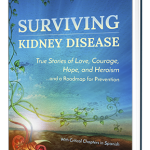 Dr. Fisher’s book, Surviving Kidney Disease: True Stories of Love, Courage, Hope, and Heroism…and a Roadmap for Prevention, is available on Amazon. Dr. Fisher is also the co-sponsor of a seminar on living kidney donation taking place in Santa Barbara on February 19. A great an informative interview and an even greater and more informative book!! Moreover,the book is an easy read, not too technical for the average reader. It does however,takes the reader on an incredible journey into Dr Fisher’s ability to pair his extreme medical knowledge with his ability to show that compassion must be an equal part of the medical practioner! This book shouild be required reading for all medical students…in fact all folks! !